Johann Zarco and Pol Espargaro 2019 MotoGP Replica Sports Biker JacketExclusively made by Reltex ..
VR46 Special Edition Monster Energy Yamaha MotoGP Replica Sports Biker JacketExclusively made by ..
Valentino Rossi VR46 Limited Edition RACE LEATHERS Exclusively made and sold by Reltex Leathers ..
Tyco SUZUKI Team TAS Racing Limited Edition Replica RACE LEATHERSAs worn professionally by Supersp..
Alex Rins and Joan Mir 2019 MotoGP Limited Edition RACE LEATHERS Exclusively made and sold by Rel..
Johann Zarco and Pol Espargaro 2019 MotoGP Limited Edition RACE LEATHERS Exclusively made and sol..
Andrea Iannone THE MANIAC Jerez Testing Limited Edition RACE LEATHERS Exclusively made and sold b..
Jorge Lorenzo 2019 Jerez Test Session Limited Edition RACE LEATHERS Exclusively made and sold by ..
Special Edition Track Pro MV Agusta Armoured Biker Trouser Exclusively made by Reltex Leathers ..
Special Edition GP Italia MV Agusta Classic Armoured Biker Trouser Exclusively made by RTX Leat..
Design: Exactly as shown, with mesh leather front, optional hump on the rear for added protection an.. Rarely does a new model cause such a powerful and positive echo the way this 100% smooth hand picked..
Special Edition Aprilia Sports Biker Jacket Exclusively made by RTX Leathers Accordion leathe..
Overview: Race grade Cowhide leather Dual stitched main seam construction Temperfoam..
1.3mm Cowhide Leather Construction CE EN 1621-1 Shoulder, Elbow and Knee Protection (with Premi..
Limited Edition* Dani Pedrosa & Marc Marquez team Repsol Honda Replica Race Leathers Exclusiv..
Kevin Schwantz Pepsi SUZUKI Limited Edition RACE LEATHERS Exclusively made and sold by Reltex Lea..
Classic Iconic Design Ultra Cool Rarely does a new model cause such a powerful and positive ech..
BEST SELLER - UPDATED DESIGN - CE Approved PERFORATED JACKET & TROUSER FRONT Ide..
Retro cool vintage style Yamaha bike owners companion. Ideal that special ride out, hanging around b..
RRP £40 Hard Knuckle Waterproof RELTEX faux leather motorcycle sports gloves are designed for s.. Your BESPOKE Size - Your Preferred Design (from our entire* design collection) - In your Unique..
WGP Yamaha Anniversary Edition Race Leathers An affordable luxury essential for the owners..
RRP £125 - Pro Race - CE Armoured Full leather design. RELTEX Radon high tech track day..
High Tech - RRP £125 - Full Leather KEPROTEC. RELTEX Radon high tech track day ready gl..
Limited Edition* - One Piece Race Leathers - Track Ready Ideal for the proud lucky owne..
Advanced CE Seam Racer Pro Design: Exactly as shown. Internally high quality dense cotton lined..
Trendy Super Value Exclusive Available in solid black, this goth style zip up jacket is cool bl..
Retro Classic Brando Style Custom Biker Material: A1 grade full grain 1.3mm cowhide leather. Th..
Biker Style Exclusive Cool Casual Material: A1 grade full grain 1.2mm cowhide leather. This is ..
Semi-Slim Fit Classic Look Soft Cowhide This is goth indie style mean looking leather jacket, a.. Fully printed on design Especially made to order For further details please contact us on 020..
Ultra Cool - Exclusive - Timeless Classic This jacket is as shown to be worn by Tanner ..
Real Leather - Iconic Design - Latest Edition This is a leather casual trubute jacket t..
Real Leather - Iconic Design - American Flag Edition This is a leather casual trub..
Real Leather - Iconic Design - American Flag Edition This is a leather casual trubute j.. Style as worn by Brad Pitt - Exclusive Replica - Film Noir Classic This real leather ja..
RRP £60 Hard Knuckle Waterproof RELTEX leathers motorcycle sports gloves are designed for safet..
RELTEX MotoX vented leather gloves are anatomically shaped for the perfect feel and grip. Superior p..
Vented - RRP £50 - Armoured RELTEX MotoX vented leather gloves are anatomically shaped ..
• Soft leather upper & palm • Elasticated comfort fit • Colourfast and Sweatproo..
RRP £125 - Race Ready - CE Armoured Full leather design. RELTEX Radon high tech track d..
High Tech - RRP £125 - Race Ready RELTEX Radon high tech track day ready gloves are ana..
RRP £150 All Season Dual Cuff RELTEX Radon high tech track day ready gloves are anatomically sh..
Sports Pro - RRP £150 - Kangroo Palm RELTEX Krypton professional grade gloves are anato..
We offer a wide range of be-spoke leathers customisation features. You can create Race Leathers tailored exactly to your requirements, quickly and easily, by selecting the options. If you do not find a required feature, ask us and we will try to accommodate your request. Although there are some exceptions, we can create almost anything you want. Ask for FREE QUOTE Now. 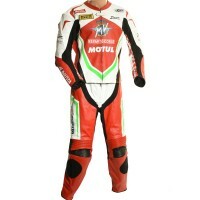 Our leathers come in a multitude of colours to match your choice, style, bike or race team. We can develop any required colour from a range of Pantone shades. We can accommodate your choices as all of our production is done in- house. We offer you a choice from Kangaroo, Cowhide, Sheep or Goat Leathers. Standard Sizes from XXXS to 8XL and everything in between is made to measure that will have your leathers feel comfortable and wearable all day long. We can print, patch, embroider, engrave or emboss several different types of names, numbers and logos. We care about your safety; that's why all our leathers are safety stitched. Motorbike Leathers are equipped with CE Internal & external protections to ensure safe and secure ride. UKs biggest suit selection of one and two piece CE armoured leather suits with unlimited combin.. Wide selection of high quality protective gloves & motorcycle biker boots ..
A selection of essential accessories for the race biker in you ..
A hand picked selection of protective leather trousers for the road ..
Reltex offers the most keenly priced premium custom made leathers available on the market. Reltex of..
Up to 75% Off RRP - Grab a Bargain ..